What accounts for the abundance of Northern Case Makers in Western waters. How does the angler translate what the fish are eating to what fly pattern to tie on. First, find out what type or order of insect is on the water. Capture one and examine it closely (use a 8x or higher magnifying glass if necessary). If the insects are on the water, use a tropical-fish aquarium net and dip it into the flow above the bug and let the current deliver it into the net. If you observe fish feeding underwater, you can go a couple of ways. The optimal is to catch an active feeder, and use a stomach pump. The pump is a great way to reveal the contents of their stomach without harming the fish. With insect in hand, the order and stage can be determined (e.g., nymph, dun, spinner). The section below explains the various stages. The effort to find and identify what the fish is eating should allow you to select a matching fly pattern of the correct size, shape, color, and type. 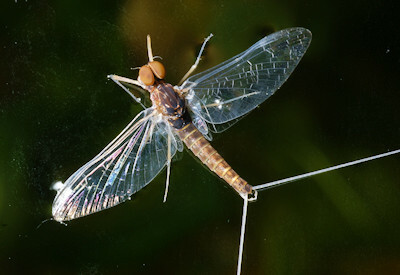 Pay close attention to these local bugs when fly fishing in the Sierra Nevada Mountains. Read more. 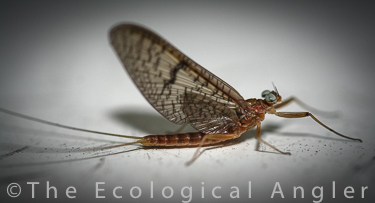 Being an important insect to the freshwater fly fisherman, let's take a closer look at its distinct life stages. Mayfly eggs hatch into an underwater from called a nymph. The nymphs grow from a very small size through progressively larger stages. Each stage, called an instar, is accompanied by a molt. The nymph forms can vary greatly in shape, depending on the ecosystem they have adapted to (e.g., fast or slow moving water). 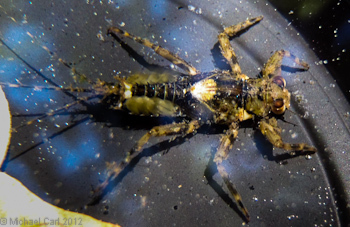 When the nymph becomes fully grown, it swims to the surface. There, it emerges into a winged fly called a dun by splitting and shedding its nymphal skin. Once emerged, the dun rests on the top of the water allowing its wings to dry, and then flies away to nearby trees or structure on the shore. Then dun appears drab in color with dull opaque wings, and tails roughly as long the body. This emergence process is commonly referred to as the hatch. Once off the water, it rests for a range of a few hours to a few days and then undergones a final molt into a spinner. The spinner appears bright and shiny with a tail about twice as long as its body. The wings are transparent. The spinners return to the river, mate in a swarm and fall spent into the stream after laying their eggs. Then I irritate myself over the matter of which fly to use, finally darting my hand blindly into the fly box. I come up with one I tied myself that imitates the effect of a riot gun on a love seat.